Trooper Allen Stanton speaks with Livingston Fire Chief, Corky Cochran (yes, that's a leaner and healthy looking Bryan Jones in the background). 3 Vehicle Accident Hospitalizes Humble Woman, GOODRICH, December 27, 2013 - At approximately 4:05 pm on December 26, 2013, a gray 2003 Lincoln Navigator driven by Dennis Lavoyd Davis, 40, of Cypress, was north-bound on US-59 in the vicinity of Goodrich. Davis was in the right lane and drifted into the left lane (the passing lane) and rearended a blue 2005 Ford Mustang driven by Natalie Nacole Terry, 34, of Humble. Terry was slowing down to make a left turn onto the south end of Loop 393. The collision knocked Terry into a silver Ford F-150 (in front of her) Driven by Edwin Jerome Woods, 49, of Houston. 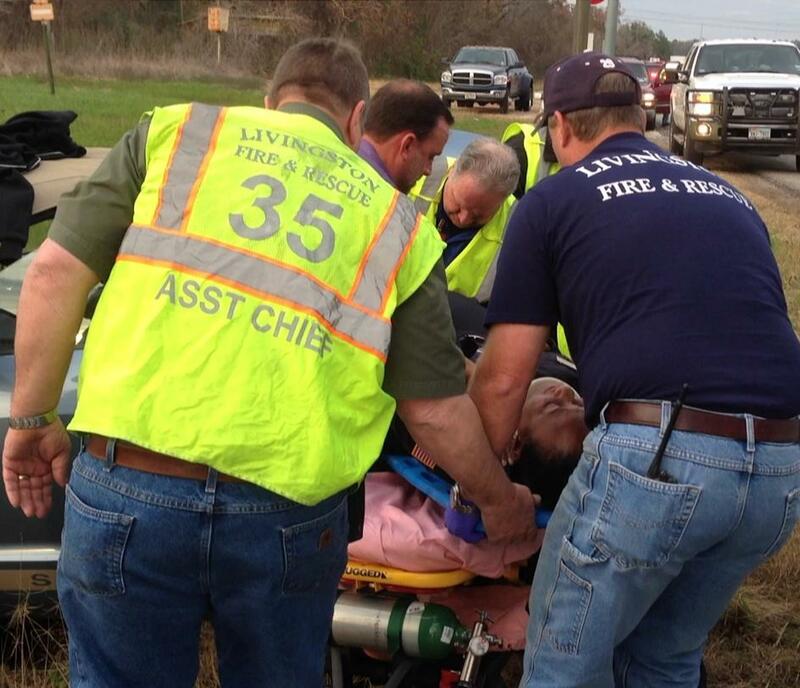 Terry's vehicle crossed over the south-bound lanes of traffic and slid into the grass on the south side of 59. The other two vehicle pulled over to the side of the north-bound lanes. Americare Ambulance Service was dispatched to the scene along with the Livingston Volunteer Fire Department Heavy Rescue Unit and Troopers Allen Stanton, Darwon Evans and Corporal Ramey Bass (all with the Texas Highway Patrol). The troopers were assisted by Sergeant Jason Paske with the Polk County Sheriff's Office. Natalie Terry was trapped in her vehicle and was freed by firemen and loaded onto an ambulance and transported to Livingston Memorial Hospital. Traffic was partially blocked on both sides of 59 during investigation and cleanup. Investigating Officer, Trooper Allen Stanton cited the driver of the Navigator (Dennis Davis) for failure to maintain a single lane of traffic. The Mustang and the Navigator were recovered by Ken's Towing and will be stored at Harrison Body Shop in Livingston while the Ford F-150 as driven from the scene. 34 year old Natalie Terry, of Humble, was rearended as she was slowing down to make a left turn onto Loop 393 in Goodrich. Terry was trapped in her vehicle but was freed by emergency personnel and take by ambulance to Livingston Memorial Hospital. 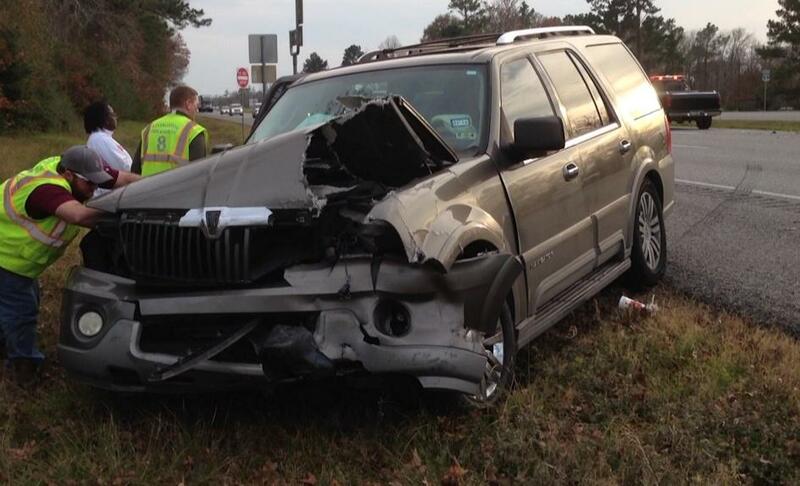 She was rearended by this 2003 Lincoln Navigator driven by 40 year old Dennis Davis of Cypress. 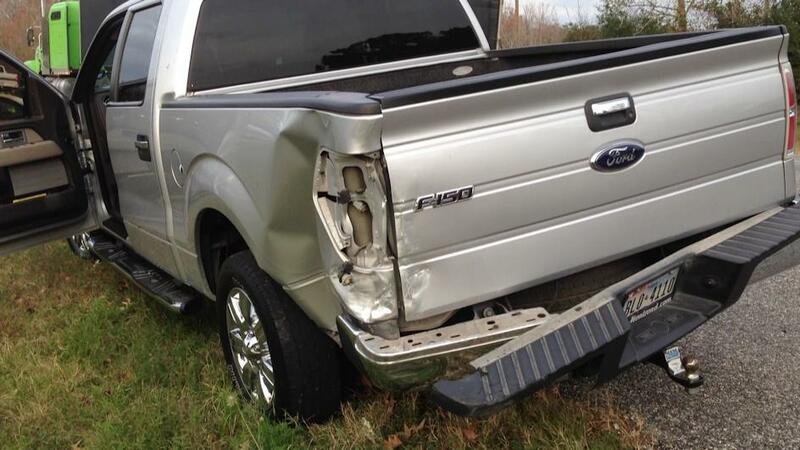 She was knocked into this 2010 Ford F-150 driven by 49 year old Jermoe Woods of Houston. Trooper Stanton was assisted by Corporal Ramey Bass (left) and Trooper Darwon Evans.